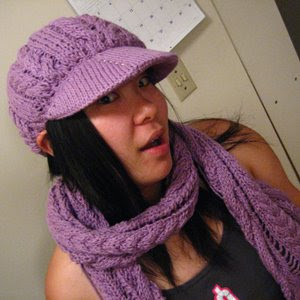 Me modeling a hat and scarf I'm working on for my friend Sherry. "Hey Sherry! I'm almost done! Almost." I have not posted in FOREVER. I haven't knitted much either since I've been on this photography kick. I've only got one FO that I haven't taken a picture of yet. I've gotten so lazy! Anyway, I may start posting more frequently soon. Stay tuned!